The fourth edition of the HAPTICA® live ’16 on 16th March in Bonn was a win for the haptic advertisement. A first-class and diverse exhibition mix, interested visitors from the advertising and marketing branches conducted constructive discussions and presented creative concepts. Interesting facts and “perceptibly different” presentations and happy winners at the Promotional Gift Award rounded off this important annual event of the advertising branch. We can proudly proclaim to have taken along one of the coveted awards in the category Merchandising to Berlin. Mark Knopfler is undoubtedly one of the biggest guitarists of the world and is ranked among the “best-selling music artists” in the history of music. 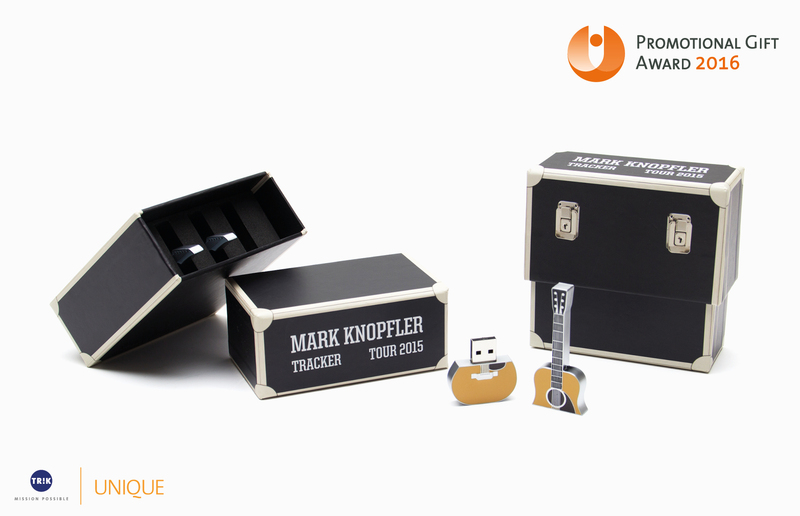 The USB flash-drive in the shape of a miniature guitar was developed and produced in metal injection moulding process especially for the “Mark Knopfler Tracker Tour 2015”. The 4 GB sized memory device could be bought after the show as a special souvenir with the live recording of the just watched concert. 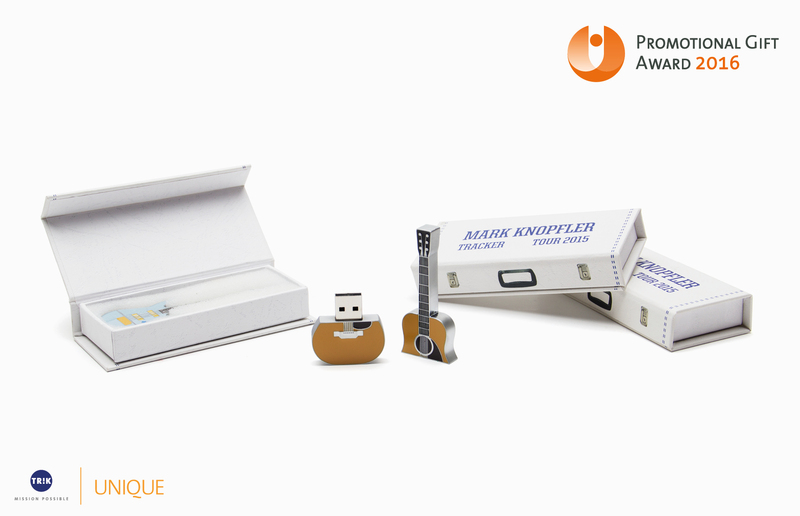 The miniature guitars were exactly recreated from the ones Mark Kopfler played during the Tour: a Gibson Les Paul, a Martin D and a Blue Pensa D.
The idea of a live recording of the concerts is at least as attractive as the design, the workmanship, the practical use and the packaging in the form of a miniature guitar case. 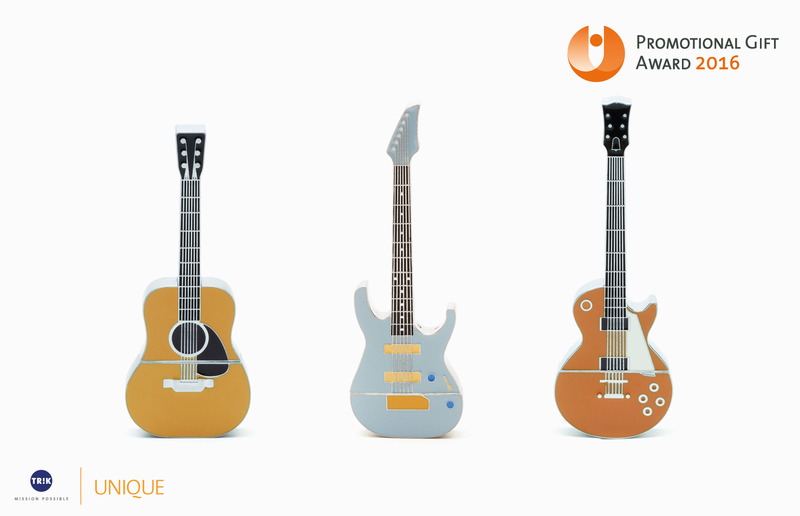 Collectors can also acquire all 3 guitars in the accompanying “mini” tri-case, stylishly and perfectly protected. The consistent overall concept captivated the jury and bestowed us with the coveted Promotional Gift Award 2016 in the category Merchandising.